Students from WHEELS, one of EL Education’s network schools. For the last 25 years or so, I’ve had the great good fortune to be connected with a radical and surprisingly successful national school reform organization and public school network. 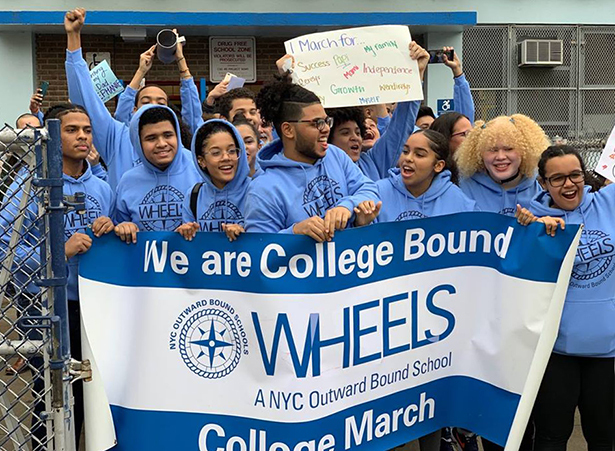 It grew from a partnership between Outward Bound and the Harvard Graduate School of Education, with a breath-of-life boost from the New American Schools Development Corporation. At its birth it was named Expeditionary Learning, and later changed its name to EL Education. Those who work with it and know of it call it simply EL. The Harvard-Outward Bound relationship was due to Paul Ylvisaker, who at one time had been director of the Ford Foundation’s Public Affairs Program. In 1987, I was on the Outward Bound board and invited Paul to give a keynote address at the International Outward Bound Conference in Cooperstown, N.Y. By that time he had left the deanship at the Harvard Graduate School of Education and was a professor there. Paul was the best speaker—and one of the best listeners—I have ever known. He understood quickly and intuitively things you thought you knew more deeply than you understood them and gave them back to you with a grace, a gift for metaphor and a perspective that were breathtaking. That’s what he did with the speech he gave that day, “The Missing Dimension”. It was a great gift to Outward Bound, and to me. He began by describing shifts that were occurring in educational thought, including a dawning sense of what it meant to be a whole person. Then he referenced the recent work of Howard Gardner and his identification of seven mental competencies, noting that schools typically paid attention to only one or two of them. Then he spoke to Outward Bound about Outward Bound, about what he saw in Outward Bound that was an important missing ingredient in public schools and challenged Outward Bound to be more articulate and aggressive in the debate about where education should be going. Then he invited Outward Bound to come work together with the Harvard Graduate School of Education. Thus, in 1988, the Harvard-Outward Bound Project on Experience-Based Education was begun. Outward Bound people taught courses on experiential learning at Harvard, mentored and counseled graduate students, put together an annual conference on “Active Learning in the Middle School”, wrote papers and generally offered an experiential dimension to the mix. Faculty members at Harvard were the first to suggest to Outward Bound that it should make a proposal to New American Schools. “To start a school is to proclaim what it means to be a human being” is the first line of the proposal Outward Bound sent to the New American Schools Development Corporation (NAS) on Valentine’s Day in 1992. The proposal, titled “Expeditionary Learning”, was Outward Bound’s response to an invitation for designs that would “break the mold” in public schools from kindergarten through high school, that would be different and dramatically better than what existed then, and that would be scalable. These were not to be programs in schools but designs for reorganizing everything about doing school. NAS, a national nonprofit, was put together largely by David Kearns, the former CEO of Xerox, who became an Assistant Secretary of Education under Lamar Alexander. President George H.W. Bush helped Alexander and Kearns, who later served on the Ford Foundation board, raise more than $200 million from large foundations and corporations to fund the effort. Kearns and his compatriots thought that we weren’t going to get the changes in schools we needed through incremental means, that the American genius was for big ideas, and that the NAS effort could find the best of these and help them prove themselves in the field and grow to scale in the educational marketplace. The Outward Bound proposal was selected by NAS as one of 12 to be funded from almost 700 submitted. It placed character development together with academic learning at the pinnacle. It would address most if not all the curriculum through “learning expeditions”, deep, semester-length, usually multidisciplinary explorations of compelling questions or themes. These learning expeditions would involve fieldwork, comprise several related projects and culminate in final projects and presentations to audiences beyond the classroom. In EL schools, teaching and learning would be active whether in the context of an expedition or not. Teachers would talk less. Students would talk more. There would be structures, like student-led parent-teacher conferences, portfolio presentations, an approach we called “crew” and exhibitions of student work that would help put them in charge of their own learning and motivate them to do their best work. NAS offered more than funding. They managed their contracts with vision and a keen sense of program and organization. They brought the 12 organizations that had been chosen together several times a year to compare experiences and work on common problems. They provided the services of expert consultants in pertinent fields. And they helped make a market for whole-school designs and find districts willing and able to engage with us. EL’s plan drew upon the more than 60 years of craft wisdom of Outward Bound and the educational ideas of its founder, Kurt Hahn, the German-Jewish headmaster. Schools he founded in many countries and educational innovations he introduced were all about character, which he knew with conviction was much more important than academics in making a productive life. Outward Bound began in Great Britain in 1941, ostensibly to train British merchant seamen to survive at sea and to rescue and take care of others. It applied in short and dramatic form the principles Hahn had used every day and throughout the school year in boarding schools in Germany and Scotland. It was quickly seen as good for young people in many different walks of life, and spread throughout the British Empire. It came into the United States in 1962 via Josh Miner, a faculty member at Phillips Academy in Andover., Mass., who had worked at Hahn’s school in Scotland for a couple years, and its first manifestation in the United States was the Colorado Outward Bound School. By 1992, Outward Bound in the United States had grown to include five wilderness schools and three urban centers, and operated with an annual budget of $30 million. It had given rise to dozens of offshoots and hundreds of imitators, and had worked productively with many schools and school districts and youth-serving nonprofits. I took a month-long instructors’ training course at the Colorado Outward Bound School in 1964, and, having been a high school English teacher, was moved by my experience to think schools would be a lot better if it they were more like Outward Bound. For one thing, the idea of the course was to be sure to get everyone over the mountain, not to see who could get over the mountain first. For another, unlike most students after the second grade in most schools, we were never bored. We were doing things that we were pretty sure we couldn’t do and experiencing the larger sense of possibilities that accompanies that experience. The learning was not only hands-on, but bodies on, and we were never going to forget it. And over the course of an Outward Bound course the students gradually take over. I thought, shouldn’t this be the way schools are organized? Couldn’t you teach algebra this way, or science, or reading and writing? EL’s 25-year history is in part the story of figuring out with classroom teachers how to teach their subjects this way, and how to work with principals and teachers to create a school culture that supports positive and ethical character development and doing for others. It is a leading practitioner and proponent of the idea of enlarging the current working definition of student achievement (test scores) to include academic mastery, positive character and the commitment to do nothing less than your best work. One of the things that sets EL apart from many school reform efforts is that the voices of teachers prevail. The professional development EL provides is extensive, pertinent and developed from 25 years of working with and listening to teachers about what helps them most. Great teachers and principals make up the bulk of the EL staff, coaches and leadership. One of the mottos you hear everywhere in Outward Bound is, “We are crew, not passengers.” You also hear it in all EL schools. Crew is an important structure in EL. It takes the place of what in conventional schools is home room or advisory. It is the central structure for supporting students socially, emotionally and academically; for making sure no one slips through the cracks; and for establishing school culture. It usually comprises 12 to15 students and a faculty member who stay together for several years and help each other through. In most schools, crew meets daily. It is not only a structure but also a mindset: active rather than passive; goal-oriented and mutually supportive; celebratory; connected; and interested in both collective and individual achievement. EL aims at making existing schools better and helping create new schools that are good in communities where good schools are rare and most needed. It doesn’t run any schools; it contracts with them to help them implement the EL design. Schools and school districts pay EL for its services, which include pertinent, excellent and sustained professional development for all faculty and staff. School funds are supplemented with foundation and government grants. EL operates with a $28 million annual budget and receives grant support from the U.S. Department of Education and many large and mid-sized foundations. There is a national network of more than 150 EL schools, slightly more than half of which are public district schools and the rest public charters. About a third are elementary schools, a third middle schools and a third high schools. Schools that implement EL fully routinely outperform their districts and states on standardized tests, even though they have a high proportion of low-income students. (EL doesn’t partner with schools with fewer than 40 percent of its students qualifying for free and reduced lunch). If they are high schools, the standard is for every student to be admitted to college whether or not she chooses to go, and this standard is usually met. And the schools are palpably joyful places where students and teachers really want to be. There are 50,000 students in these schools, located in 33 states and the District of Columbia. With another 330 public schools, EL has “literacy partnerships”, meaning that they are not trying to fully implement the EL model but just its k-8 language arts curriculum, supported by EL’s related professional development. All the k-8 schools in Detroit; all the k-8 schools in Wake County, N. C., which includes Raleigh and Durham; and all the k-8 schools in Shelby County, Tenn., which includes Memphis, are in this group, comprising 150,000 students. This k-8 language arts curriculum, developed by EL in the last several years, is given the top rating by independent reviewer EdReports.org. It is rigorous, and tuned to Common Core Standards. With it, students do original research and deep, interdisciplinary inquiry. They read engaging primary texts, not textbooks, that are carefully curated to be relevant to their lives. When Outward Bound submitted its proposal to NAS, we said our ambition was to see our educational ideas enter “the drinking water” of public education. That actually may be happening. The Aspen Institute’s National Commission on Social, Emotional and Academic Learning has just issued a report, “From a Nation at Risk to a Nation at Hope”, recognizing “a growing movement dedicated to the social, emotional and academic well-being of children”. This is one of those truths we used to hold as self-evident, have let slip away, though never entirely, and now are rediscovering. It used to be in the drinking water. I feel fortunate to be having a hand in getting it back in there. Greg Farrell was executive director from 1970 to 1990 of the Fund for the City of New York, established by the Ford Foundation to help improve the quality of life and government in New York City.